Home » Our Doctors » Dr. Irfan Alam, O.D. Dr. Alam completed his Honours Bachelor of Science degree at the University of Waterloo in 2007.He went on to complete his Optometry education overseas at the University of Ulster in Coleraine, Northern Ireland and finished top of his program with First Class Distinction in 2010. He went on to complete his residency year at a full scope eye clinic in Dundee, Scotland and had the opportunity to work alongside Tertiary Care Specialists at Ninewells Hospital and Medical School as part of his residency year. 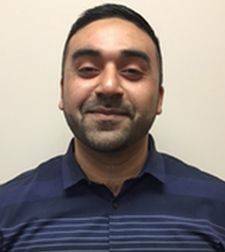 After completion of his residency, Dr. Alam continued practicing Optometry in Scotland for an additional 2 years. During which, he was part of a mobile eye clinic; providing primary eye care to remote areas of the Country, in addition to home visits for the elderly with limited mobility. Upon returning back home to Canada, Dr. Alam has successfully updated his credentials at the University of Waterloo, and has recently joined the team at Saugeen Vison Centre. Dr. Alam is very passionate and thorough about what he does, and provides a very comfortable and never rushed consultation to his patients. Dr. Alam is a Mississauga native, and has been married for over 10 years and have two beautiful daughters. He enjoys going to the gym, hiking, visiting cottage country, and above all spending time with family.